The already broad appeal of the A7 Sportback with its elegant coupe styling and five-seat versatility is being expanded once more with the introduction of a new lead-in V6 TDI version that can be ordered now. 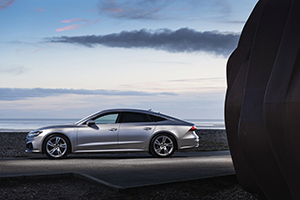 Drawing on 231PS of power and 500Nm of torque, the new A7 Sportback 45 TDI quattro delivers the kind of exceptionally smooth, refined and powerful progress that elevates a six-cylinder unit above the norm, but won’t destabilise the balance sheet for business users with its 50.4mpg capability and WLTP-certified emissions of as little as 147g/km. A major contributor to the overall frugality of the V6 TDI unit is the 48V mild-hybrid (MHEV) drivetrain fitted as standard, which in real-world driving reduces fuel consumption by up to 0.7 litres per 100 kilometres. It does so by intelligently shutting off the engine at speeds of between 34 and 99mph and enables the A7 Sportback to coast in freewheeling mode. The Belt Alternator Starter (BAS) re-fires the engine smoothly and comfortably after coasting, and is capable of channelling up to 12kW of energy back into the lithium ion battery during recuperative braking. The start-stop functionality has also been significantly expanded and now activates at 13mph. In combination with the standard front camera, the engine is restarted predictively while at a standstill as soon as the vehicle ahead begins to move. Despite possessing the lowest power output of the current V6 line-up in the A7 Sportback, performance is still very much a priority – the 0-62mph sprint takes 6.5 seconds, with a 155mph top speed to call upon. Channelled through a smooth yet swift-shifting eight-speed tiptronic and permanent quattro all-wheel drive, the 231PS output is boosted by 13PS over the equivalent version in the outgoing A7 Sportback, and a brawny 500Nm of torque is spread over a wide bandwidth from 1,750rpm to 3,250rpm. In terms of specification, the A7 Sportback 45 TDI quattro is also far from lacking. It gains a host of standard equipment in Sport specification that ranges from MMI Navigation Plus with MMI Touch, the Audi Virtual Cockpit and a rear-view camera to Audi pre-sense front, a lane departure warning system and LED lights front and rear. On S line versions, alloy wheels move up to 20 inches as standard (19” for Sport models), with Sport suspension and HD Matrix LED headlights incorporating a unique coming and leaving home animation. OTR pricing starts from £52,240 OTR, rising to £55,140 OTR for S line models. Start at the basics, what fault codes are stored and solve them, if the problem remains, dig deeper. Re: 2 DIN Unit in a Passat B5 Been told its not possible, please help.